Growing cilantro isn’t just for salsa lovers. Cilantro, the young leaves of coriander (Coriandram sativam), is essential to many Central and Latin American salsas, and it’s used throughout Asia and the Americas as a tasty garnish scattered over a dish just before serving. Also known as Chinese Parsley. 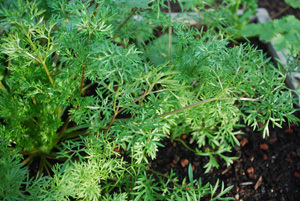 All parts of the coriander plant are edible. Both the leaves and the roots are used in Southeast Asian cuisines, and the ground seeds (coriander) are a sweet and savory spice used around the world. Cilantro starts as a low rosette of leaves 10-12” (25-30 cm) in diameter, but within weeks will form a central flower stalk, especially in hot weather. 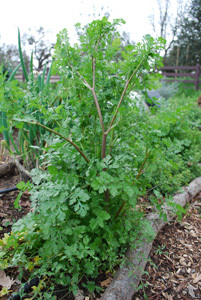 Mature coriander plants form a sprawling dome 2-3 feet (60 cm-1 m) high. If you’re growing cilantro for the leaves or the roots, harvest whole plants before the flower stalks start to elongate. But if you have the space, allow a few plants to flower, and watch what happens. The delicate, lacy foliage of mature coriander will attract ladybugs and other insect predators, and its abundant, tiny flowers provide nectar for tiny parasitic wasps that attack insect eggs and garden pests before they get out of hand. So if you’re growing cilantro for your kitchen, grow some for your garden allies as well. 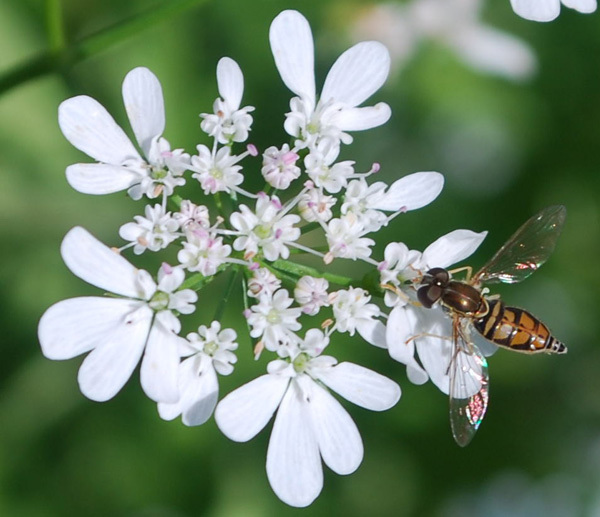 See Attracting Beneficial Insects for more information. ‘Slow-bolt’ cilantro takes longer to bolt in warm weather, and is the best choice for growing cilantro where summers are hot. 'Calypso', from Cook's Garden, is the slowest bolting cilantro variety I've found. ‘Delfino’ is a delicate, feathery-leafed variety that looks a little like dill, but still tastes like the broad-leafed cilantro we’re all familiar with. It makes a lacey garnish floated on soups. Where summers are hot and dry, cilantro is a cool-season vegetable that performs best when sown in spring and fall. Age, heat, and dryness cause cilantro to “bolt”, or send up a flower stalk. 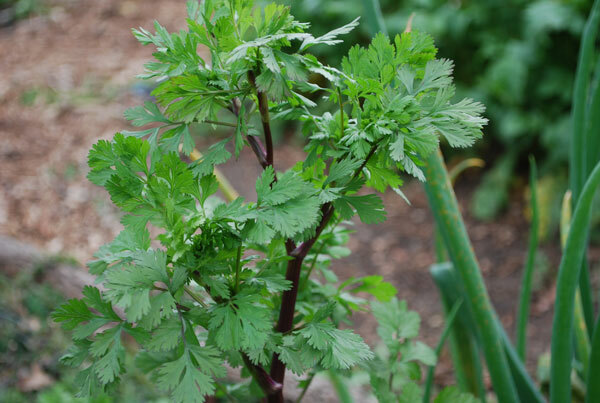 Cilantro that has bolted is still edible, but the leaves become finer and harder to harvest. The trick with growing cilantro is to fool the plant into thinking it’s perpetual spring (or fall). Give it regular, steady water, and mulch the soil to keep the surface cool. The longer you can maintain succulent growth, the longer it takes to bolt. If you’re growing cilantro in high summer, plant ‘Slow-Bolt’ cilantro in your coolest microclimate, in the shade of taller plants, or in full shade where summers are hot. 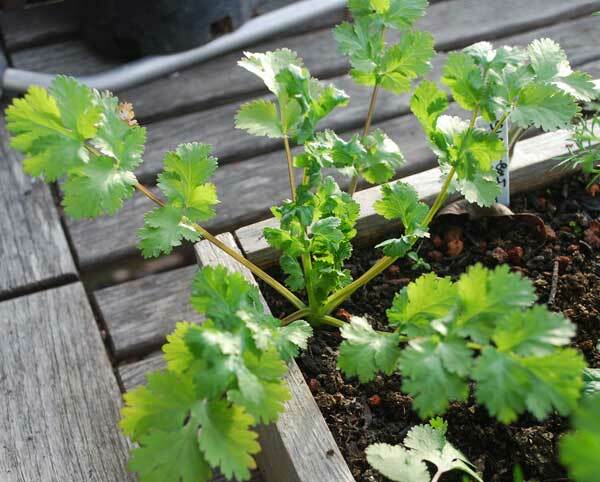 Growing cilantro in containers or in mobile salad tables allows you to move the plants into full shade easily. At the cold end of the spectrum, cilantro can survive a hard frost or two, but it’s dead once the ground freezes. Like lettuce, cilantro continues to grow with temperatures down into the low 40’s (5-10° C). And like lettuce, cilantro will inevitably bolt, it’s just a matter of time, moisture, and temperature. 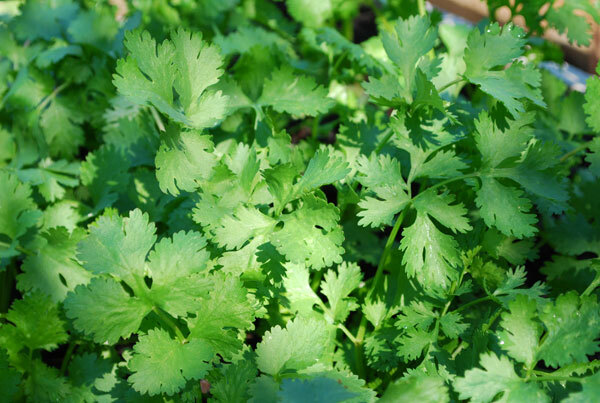 The best way to have a steady supply of cilantro from your garden is to plant small patches every 2-3 weeks. Cilantro thrives in most garden soils. Cilantro grows particularly well in loose, sandy loam, but adding aged manure and/or compost to the bed when planting produces faster and more luxurious growth. Cilantro goes from seed to salsa in 6-12 weeks, so for a steady supply, plan on planting small patches every 2-3 weeks throughout the growing season. 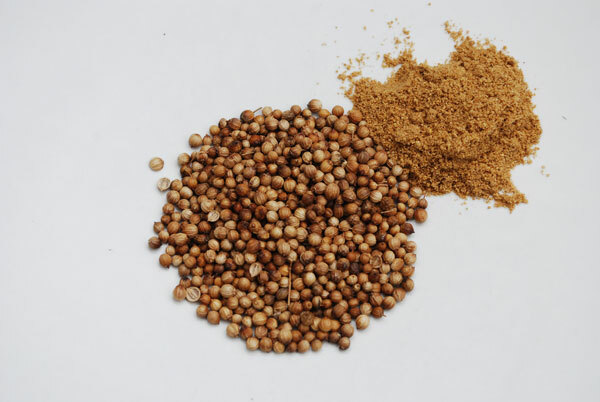 There are two seeds in each sphere of coriander, so split seeds can grow, and double seedlings are common. Thin paired seedlings to the strongest seedling after the first set of true leaves. Seeds germinate in 8-14 days, depending on temperature. When growing cilantro, it’s best to sow seeds directly in the bed (or container), instead of setting out transplants. 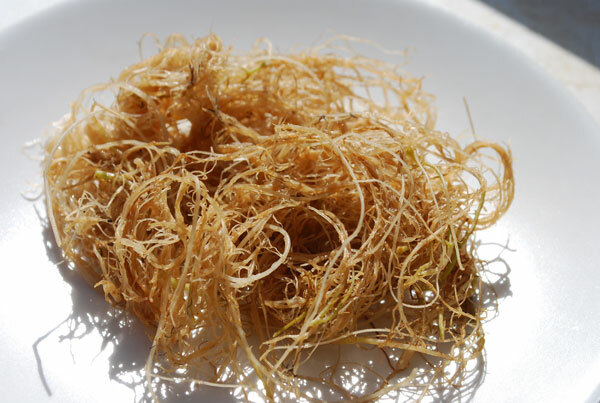 Cilantro roots grow quickly and twist together in cell-packs or small pots, and plants with twisted or damaged roots are never as strong as those started in place from seed. Can you grow cilantro from stems? It's possible—but it’s an utter waste of time. Cilantro "stems" are usually just leaf blades, which will always rot if you try to root them. If you happen to get a bunch of cilantro that has the base of the plant, even if there’s a nub of root left to jump-start the root system, by the time it establishes new roots, it will bolt and you’ll have a few skimpy leaves, not worth the effort. When growing cilantro, it’s always better to start from seed. If you’re growing cilantro in rows, dig ½” (1 cm) deep furrows 8” (20 cm) apart, and plant seeds every 2” (5 cm) along the row. Thin to 6” (15 cm) apart when the plants are 3” (8 cm) high. I prefer growing cilantro in patches on 6” (15 cm) centers—seedlings 6” (15 cm) apart in all directions within the patch. In practice, this means staggering every other row, so seeds in the second row are planted between the seeds in the first row—see hexagonal spacing for an illustration of this kind of garden spacing. Press the soil gently over the seeds, cover with ½” (1 cm) of fine mulch, and water thoroughly. 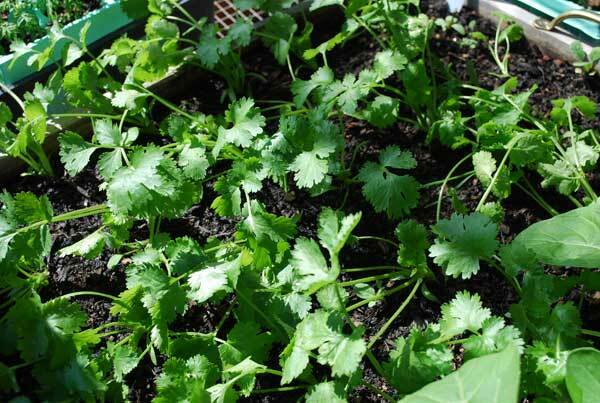 If you’re growing cilantro for coriander, its seed, set plants on a slightly wider spacing. Plant on 8” (20 cm) centers, instead of 6” (15 cm) centers. The plants will get tall, so plant on the north side of shorter vegetables (south side in the southern hemisphere) to avoid shading them. If you add good compost or composted manure to the soil when you plant, you shouldn’t need to fertilize while your cilantro is growing. 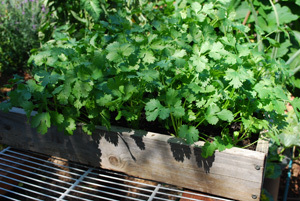 The key to growing cilantro is regular, steady water, and mulch to keep the soil surface cool. Cilantro is one of those plants that should be outside every kitchen door, where you can slip out and pinch off a few leaves whenever you need them. Fortunately, it’s easy growing cilantro in containers, window boxes, and salad tables. Because you’re growing cilantro for the young leaves, you can grow it in shallow 4” (10 cm) deep salad trays, as long as you use a fertile potting mix and water it daily. 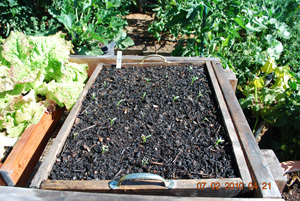 Plant seeds 4-5” (10-13 cm) apart in staggered rows. Cilantro is a little more resilient (needs water less often) in deeper window boxes or pots, but it still needs frequent watering to avoid bolting. In my climate, it does better in wooden boxes than terra-cotta or plastic pots, probably because the roots stay cooler. Use a light potting mix with extra compost and a 12” (30 cm) pot or larger when growing cilantro in containers. Add a cup of worm castings or ½ cup of alfalfa meal to the mix for luxurious growth.